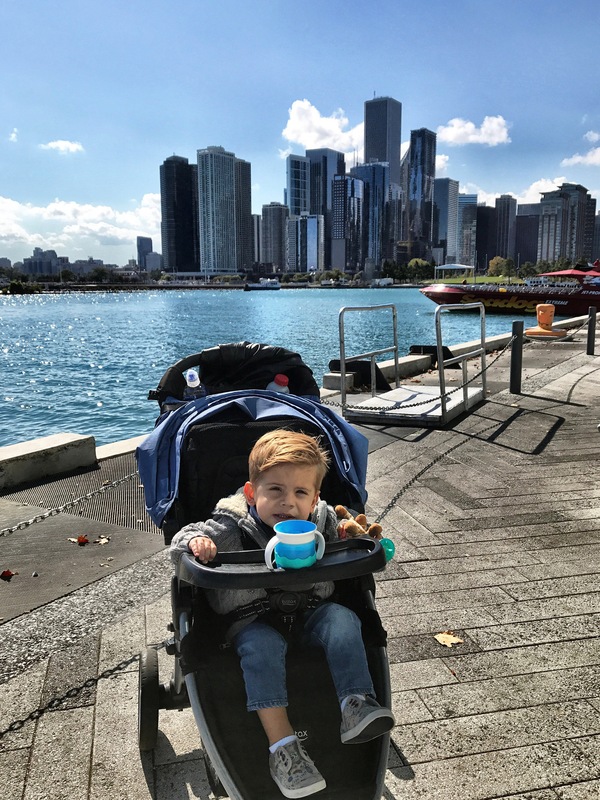 We just took a trip to Chicago with our two year old, and I found the Windy City to be even more fun to explore this time around with our little man. I love exposing Max so different places and people at a young age, and I hope he continues to be inspired to travel throughout his life. Some of my friends are a little hesitant to travel with young kids to a big city, but I its totally doable and lots of fun. 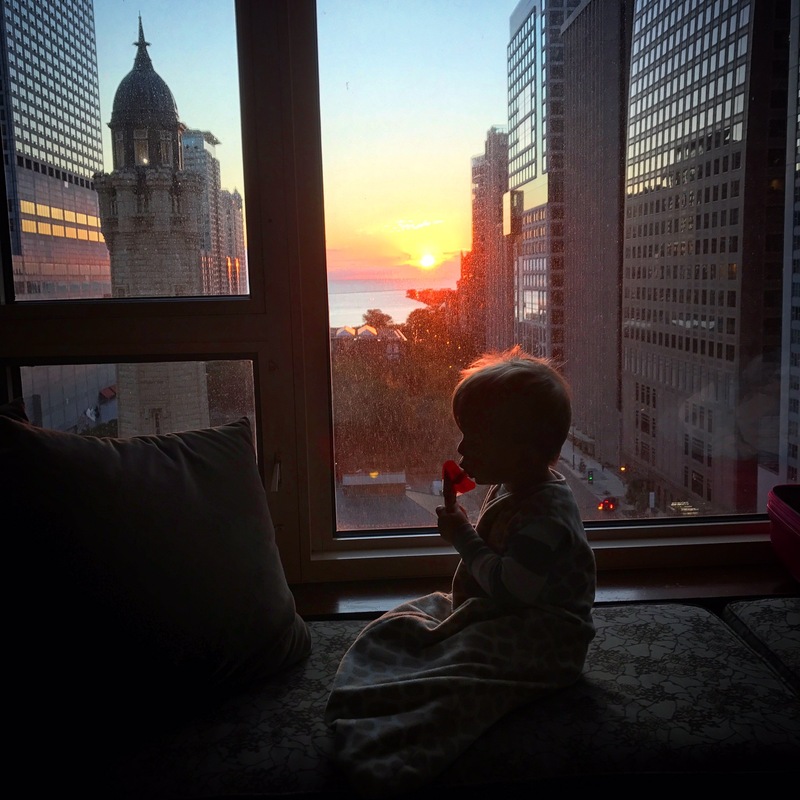 In this blog post, I’m sharing my top 10 tips for visiting Chicago with kids. Max looking down at the buses below as he eats his breakfast. Get a hotel near lots of the tourist attractions and shopping along Michigan Avenue in a strip referred to as the Magnificent Mile. During our recent visit, it was great to be able to just step out of our hotel and be in the middle of it all. We were within walking distance of almost everywhere we wanted to visit, and didn’t have to fuss with buses, taxis or ubers with our toddler. We stayed on at the Park Hyatt Chicago during our last stay, but there are lots of hotels along the strip or just a few blocks back. 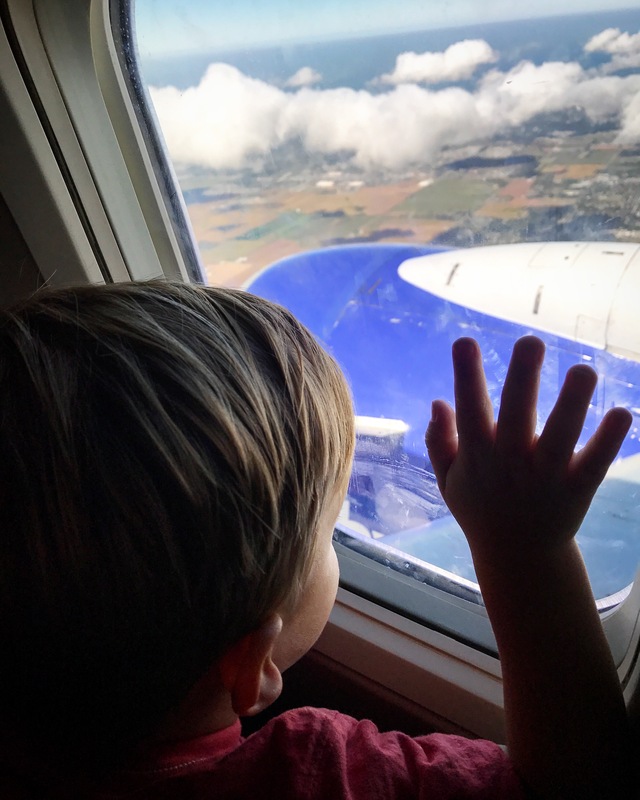 Max loved sitting near the window and watching the busses down below. 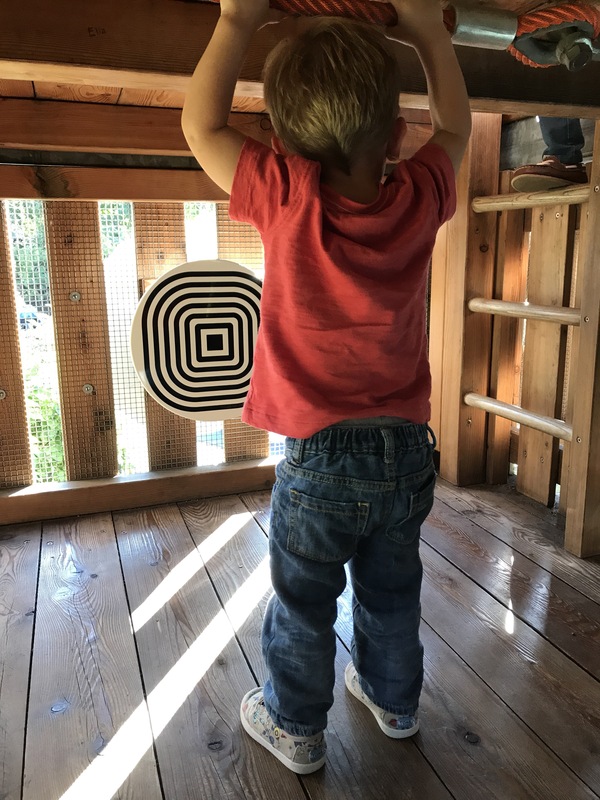 Taking a break for some play time, climbing the tower at Maggie Dailey’s playgarden. My sister lives just outside of Chicago and I saw pictures of her kiddos at Magie Dailey Park and knew we had to find it. Just east of Millennium Park (that’s the one with “The Bean), Maggie Dailey has biking and roller blading paths, tons of green space for running around and picnics, mini golf, tennis courts, rock climbing walls and the “Play Garden” which is one amazing humungous playground hidden throughout beautiful landscaping in the park. There are lots of crazy towers to climb and cool slides. It’s a great place to let the kids run lose and burn off some energy for sure! I’ve included a link to a map of the park here too! Have you seen photos of that giant silver bean statue that everyone seems to post on Facebook or Instagram on a visit to Chicago? That’s in Millennium Park, right on Michigan Avenue. (We couldn’t resist taking a million corny photos with the Bean statue while we were there either.) It’s a beautiful park that includes gardens, art exhibits, landscaped terraces and hosts large special events. 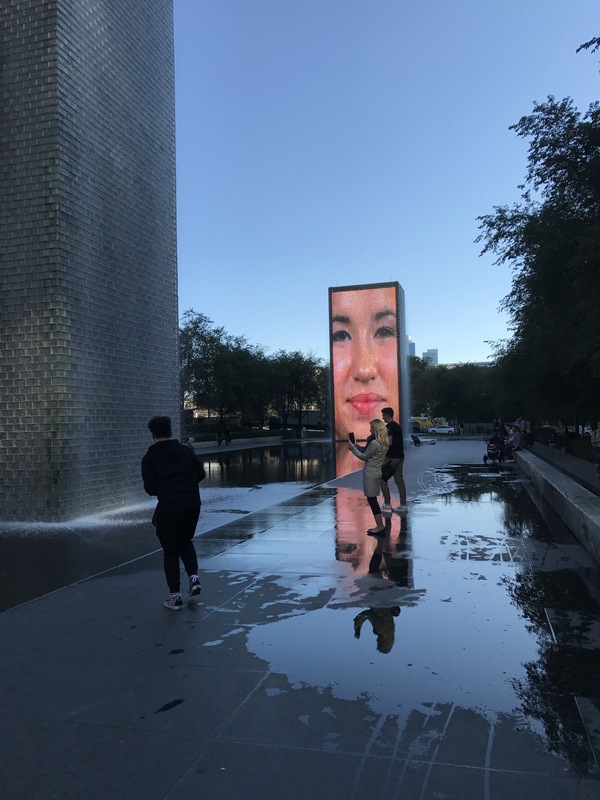 While you are at Millennium Park, don’t miss the Crown Fountain, which consistes of two waterfall video screen towers that shows faces of local Chicago residents. 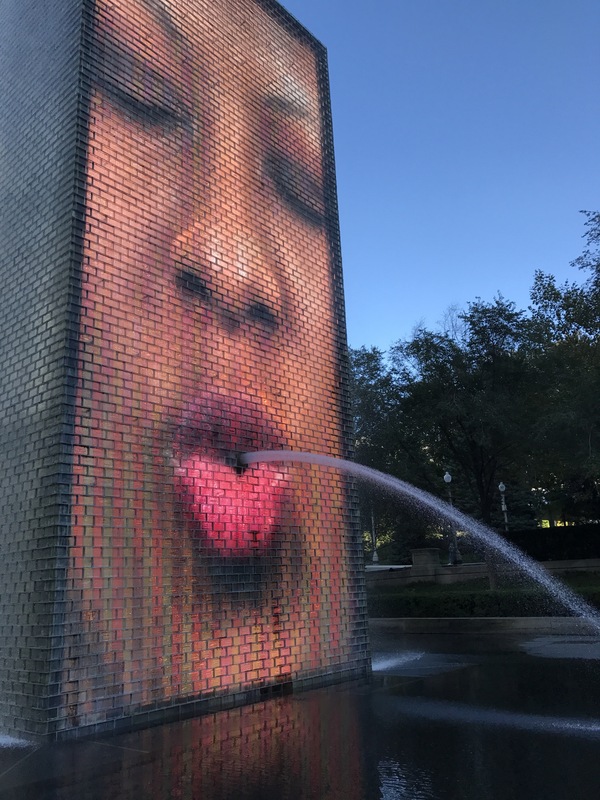 Love the funky Crown Fountain in Millenium Park. 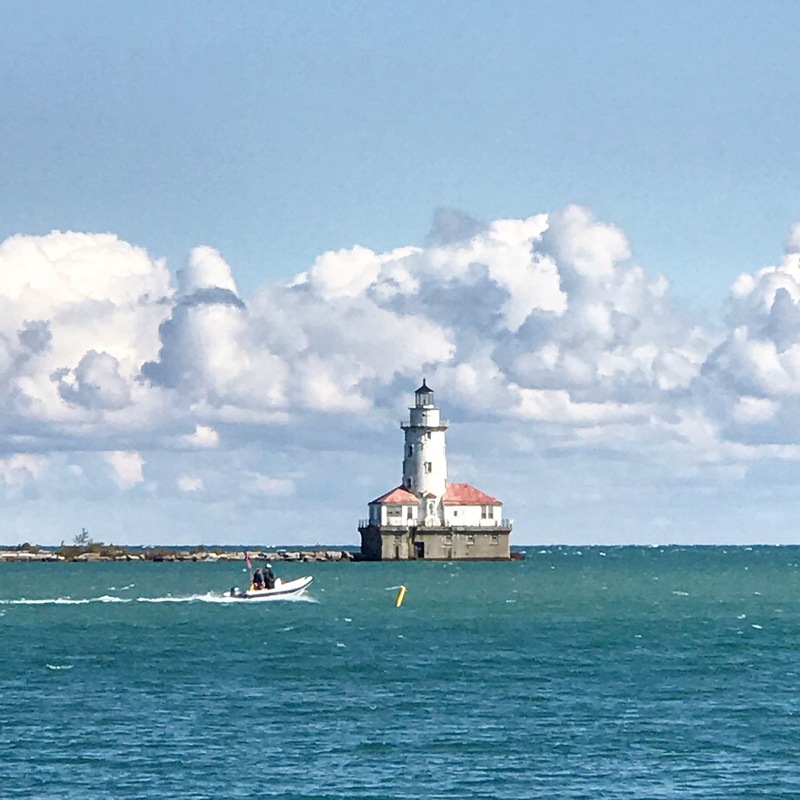 View of the lighthouse from the end of Navy Pier. You can spend all day at the Navy Pier and not do it all. The pier includes The Children’s Museum, Shakespear Theater, Imax Theater, Miller Lite Beer Garden (for mom and dad), giant ferris wheel, lots of restaurants, shops, and boating excursions. We spent an hour or two just walking around the peer exploring and watching the boats take off and come in. There is so much to see just walking along the outside promenade. 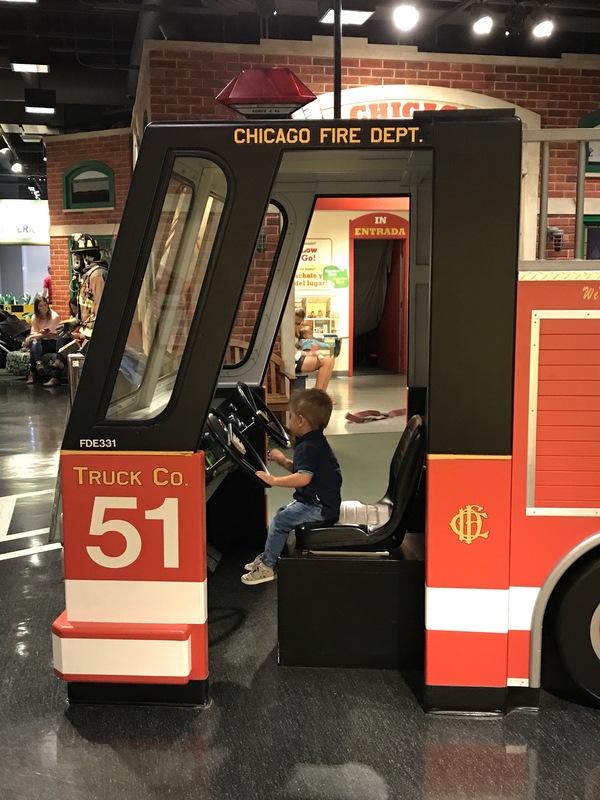 Max’s favorite part of his visit was the Chicago Children’s Museum, which is near the entrance to the Pier. I couldn’t get Max off the fire truck at the Children’s Museum. Name your favorite store and you will probably find it (and 100s more) along Chicago’s Magnificent Mile. There are several indoor malls and on-street shops. You can find LEGO, Disney, and American Girl stores for the older kids. If you have a toddler or baby that will stroller sleep, nap time is a perfect time to enjoy some shopping! 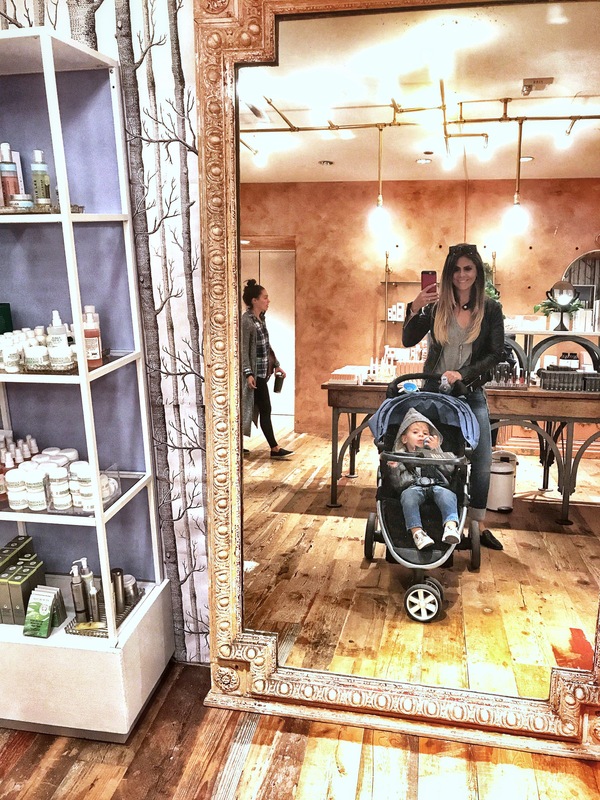 Maxwell patiently shopping at Anthropologie with mommy. Check out the Magnificent Mile’s shopping directory here. If you need a break from city life, check out the amazing Lincoln Park Zoo. Founded in 1868, this 35-acre zoo among the oldest of zoos in North America and hosts more than 1100 animals. Surprise, admission is free! One of our favorite activities in Chicago is just walking the city, taking in the amazing architecture, boats in the river, and stunning views along the shores of the water. Be sure to take a walk or jog along Chicago’s Lakefront Trail, which is a two way paved trail spanning for 18 miles along Lake Michigan. I love to run here, and Chicago hosts a marathon in the month of October each year. During our walks, Max was obsessed with pointing out every bus we came across, especially the double decker ones! My sister lives right outside of Chicago and she loves to visit the Shedd Aquarium, located right on the shores of Lake Michigan. This aquarium opened in the 1930s and boasts over 1500 species of fish, birds and other small animals. It’s located right by the planetarium and the museum of natural history, so you can check out all at once. And the beautiful attention to detail in the architecture is just as much fun to look at as the marine life. It’s easy to find quick serve food like authentic Chicago deep dish pizza or Portillos hot dogs and tamales. I have some friends who are a little hesitant to take their toddlers or younger kids out to eat at sit down restaurants. Don’t be! There are plenty of great sit down restaurants that happily accommodate younger kids too. During our stay, Max tried some yummy deep dish pizza at a cute sit down restaurant called Lou Malnadis. I absolutely fell in love with the food and funky atmosphere at Little Goat Diner, which was a trendy restaurant with inventive food where I still felt comfortable taking a 2 year old (make reservations ahead of time). 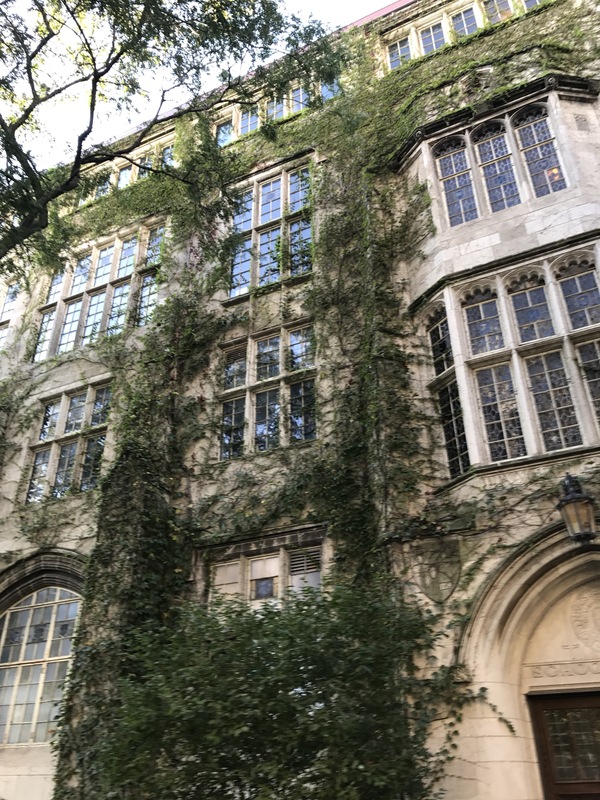 There are tons of boat excursions throughout Chicago, and one of my favorites is the good old architecture tour of downtown. It’s a fabulous way to see the city, and kiddos usually love a boat ride too. Some of the tours are up to 90 minutes, so check wait times and tour times before committing to make sure you have found the right one. Check out some sample tours and times here. Don’t forget to check out special events during your stay. Visit Choose Chicago to plan ahead, or call your hotel in advance to get the low down on any festivals or other things going on in the City. If you are are sports fan, be sure to check out schedules for baseball, basketball and football games too! A picture of people taking pictures of the Crown Fountain in Millenium Park. Max going “shopping” in the kid’s town at the Chicago Children’s Museum. Max and mommy watching the regatta at the end of Navy Pier one afternoon. The old Water Tower was right across from our hotel downtown. All along Michigan Avenue are larger planters that are filled with pretty seasonal gardens. Mommy getting ready for a quick early morning run along the shores of Lake Michigan. My uniform for most of the weekend. Lived in and loved these sneakers. Bike rentals are everywhere downtown, and in my favorite color, blue! Two points if you can spot Max in his green jacket in this photo looking up at the Bean. I love this candid I took of some folks just enjoying a beautiful day at the park. Taking lots of walks and snapping photos of the architecture. This guy was ready to hit the ground running. Awesome mural in the tunnel under Michigan Avenue on my way to run along the lake.